Taboon simply means oven. It is an outdoor oven dug in to the ground, filled with stones to retain its hot temperature and animal dung is used to fuel it, giving off a seriously pungent smell. One with good associations. The quality of the bread produced from that dung hole makes it a tradition worth saving. The taboon has been in use for thousands of years. In the Palestine of days gone by, you would prepare your dough for your bread and take it to the baker in the village to bake it for you. Although that time has passed, the Taboon lives on in some corners of Palestine. Hosh Yasmin, an organic farm and restaurant in Beit Jala is one such place, serving delicious bread and seasonal taboon dishes. The views are good too. Conventional home ovens do not attain the heat or conditions required to make taboon bread. 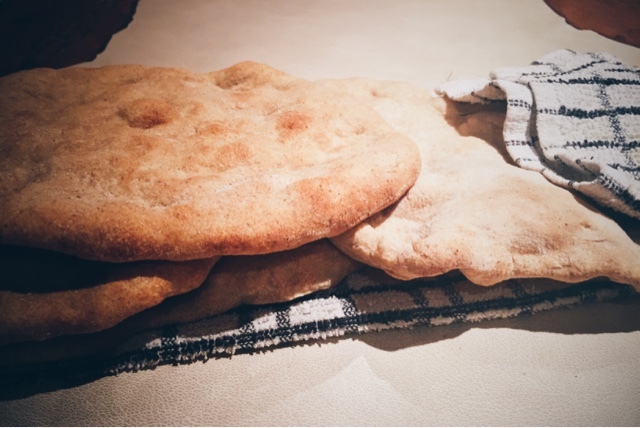 This recipe tries to emulate the conditions of a taboon in order to make a bread that is a little crusty and chewy on the outside and a little soft on the inside. It involves simply a spray can of water and a bag of stones (I ‘mined’ mine from the street outside my flat. In my pyjamas, grappling with a carrier bag if you would like to imagine). A beach might be a better spot. 420g strong white bread flour / strong whole wheat bread flour or a mixture plus extra for the kneading. Sieve the flour through a fine mesh. Combine the flour the salt and mix well with your fingers making a well in the centre. Combine the warm water, rose water, sugar and olive oil in a jug and mix well. Slowly pour the liquid into the flour making an almost rubbing like motion with your fingers to combine the two. Continue until all of the liquid is incorporated into the flour. You then move the dough around the mixing bowl with your hand slightly cupped and you will then end up with a sticky dough. If it is dry add a small amount of water. If it is too sticky add a small amount of flour. Also add small amounts and gradually to obtain the right consistency…caution is advised! This is quite a sticky dough; for the last 30 ml of water pour slowly as depending on your flour you may need a little more or less. You should then work the dough; stretch it with the heel of your hand as far as you can before folding it together into a ball and turning it over and rotating. Repeat this until the dough is able to stretch very thin without breaking. This will indicate that the glutens have been worked sufficiently. You can also poke the dough and it should bounce back indicating that the dough is ready. Time wise the dough will usually need approximately ten minutes of kneading. Grease a bowl with olive oil and also lightly grease the dough. Cover with cling film and a towel. Leave to prove for at least 2 hours somewhere warm. My best results were after leaving the bowl overnight near to a radiator. After the rising period, take the dough and knock it flat. Divide it into 6 pieces and roll each of them into a smooth round ball. Place on a tray and cover with a damp tea towel and leave for another 30 minutes. Lightly flour your surface and with a rolling pin roll the dough to approx 4mm thin round shapes, like a small pizza.If you are confident you can also stretch it out with your hands. Poke the surface with your finger tips to make small finger print grooves all over it. Take the tray from the oven and quickly place the breads on it. Spray the water into the oven and bake for approximately 7/8 minutes. The time will depend on how hot your oven is. Look at the bread with the oven closed when it has baked for 6 minutes to assess. When the breads are risen with some colour they are ready. Wrap in tea towels to keep them pliable.